Oil comes in a beautifully designed glass bottle. The packaging is slender, shaped irregularly, slightly tapered in the middle. Stylized for an oriental dish, closed with a gold cap. The bottle is decorated with a nice oriental design on the front side. Placing this oil on the shelf in the bathroom pleases the eye. Additionally, the cosmetics has a beautiful scent: slightly sweet and oriental. What does the L’Oreal Professionnel Mythic Oil Rich Oil comprise? It is the wealth of two high-end natural oils: argan oil and rice bran oil. 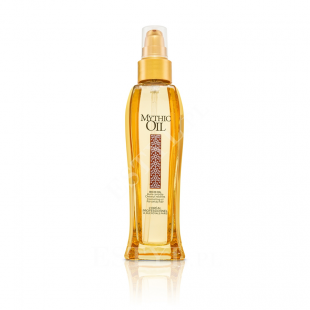 Argan oil – is a high quality natural oil, which is designed to protect hair from damage. If you often blow-dry, straighten or use strong styling cosmetics – there is no better product than argan oil. It protects the strands from mechanical damage and against adverse weather conditions. Blazing sun, strong wind, frost or chlorinated water from the swimming pool will no longer be a threat to your hair. Argan oil also protects colour-treated hair and damaged by ammonia. This will help regenerate even very dry and damaged hair, it will smooth it and prevent frizz. Wisps will become resilient and shiny and the ends regenerated and properly moisturised. Rice bran oil – provides a wealth of vitamin E – tocopherol. This vitamin, not without reason is called the “vitamin of youth”. It has direct impact on improving the appearance and condition of hair. Thanks to it, free radicals have reduced possibility of attacking cells. Vitamin E slows the ageing process and thus stops hair from falling out. What is more, it becomes silky to the touch and resilient. Rice bran oil also contains good fatty acids responsible for regulating processes taking place both on the surface and in the interior of our hair. Ferulic acid contained in the rice bran oil enhances the action of vitamin E, as well as effectively slows down hair ageing process. Coumarin used in L’Oreal oil provides antiseptic properties, prevents the proliferation of germs and bacteria on the surface of the hair, protects against harmful UV radiation. What is more, it is often used to treat psoriasis and atopic dermatitis. Additionally, it has soothing and strengthening properties. Hair oil has a capacity of 100 ml and is highly efficient, as for just one application – one or two portions of the product are enough to coat your entire hair. HOW TO USE OIL ON HAIR? L’Oreal Oil Rich Oil must be applied to dry hair (you can do this even several times a day), or on damp strands immediately after washing. In both cases, you should not rinse, just leave it on the hair to provide full protection. It is a cosmetic that is very easy to use. Hair care involving L’Oreal Rich Oil does not require much time. It is a great product for all busy and active women. WHAT EFFECT DOES THE OIL PROVIDE? Copyright © 2019 — What is the best hair oil – Meet our favourites. All Rights Reserved.